None of this, however, is in our assigned text reading for the last Sunday in Advent, which is verses 1-4, and 19-26. Let’s take these four verses together, although they are loaded with a lot of action. We’ll start with Ethan in the superscription. Different people take these differently. I don’t really ascribe to them the level of authority of scripture, but they are interesting. Ethan was known to King Solomon, according to 1 Kings 4:31, as a wise man. If Ethan was the author of this psalm, then it has to be composed before Solomon’s reign, which means it can’t be after the exile. I find this unlikely. I find it very unlikely. The themes of the psalm are too royal/messianic to reflect that early. It is far more likely that it was composed late–at, around, or after 587 B.C. when the Davidic king was deposed and the covenant seemed broken (v. 39). Some may argue that the psalm is prophetic, which is possible, but if so it would rob the immediacy and humanity of the plea. I think it was put in the “file” so to speak of psalms that were composed in the style of Ethan or the school of Ethan rather than Ethan himself. As to the content of these verses we should note two themes. The first is the psalmists commitment to praise Yahweh forever because of his covenant. We don’t know as we start reading the psalm that this commitment is a painful one. It is only in the back part of the psalm (38-52) that we know he lives in a time when the whole world has fallen apart, the covenant is in shambles. To offer praise and theological affirmation in the midst of great pain is the definition of spiritual strength and power. The second theme is that of the future generations. We find this two-fold. The first is the psalmists promise to proclaim Yahweh’s covenantal love. In the Hebrew of the MT it is hesed, but eleos in the LXX (Greek)–which is curious because they don’t really mean the same. I normally side with the LXX, but here I think I go with hesed because it fits the covenant motif of the psalm. 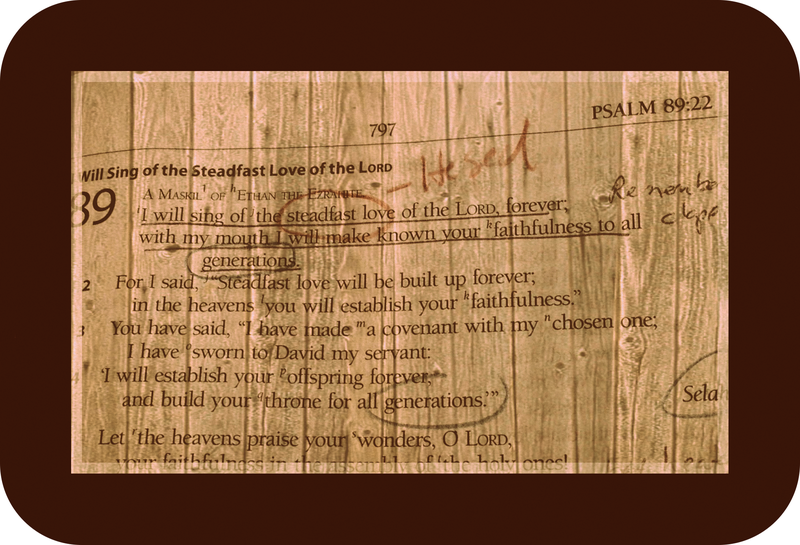 Teaching the next generation is one of the goals of this psalm. The second generational aspect is on the Davidic generations in verse 4. To Judah in exile this would be hard to swallow. From this side of history, we can see the fulfillment in the future generation that was Messiah Jesus. The old vision is a reference to 2 Samuel 7:11-17. These verses can easily be understood as a restatement of that promise which God made to David through Samuel. What I find interesting is the phrasing “to one who is mighty” and “chosen from the people” calls for the mental image of the judges rather than the monarchy. Curious choice of vocabulary for those in exile. This is the restatement of the Davidic covenant which we mentioned earlier. Two things stand out. The writer knows the whole time he writes this that the king of Judah was not strengthened by Yahweh when the Babylonians came, that the king was outwitted, that Judah was humbled by the wicked, that it was Judah who was crushed, that his horn was crushed. The closest analogy I can come to is to imagine a future world in the United States that is run by a dictator, under military police, and all civil liberties have been suspended. In the midst of that world imagine someone citing, publicly, the Pledge of Allegiance, “with liberty, and justice for all.” Either that person is hoping that someday things will be put to rights, or that person is being cruelly ironic. The same is true of this passage. Either the psalmist is holding out hope for the future, or he is being cruelly ironic. This is where I think that the lectionary division is unhelpful. These verses say more in context than they do alone. Most of us do not live in a perfect world where everything is ideal. We live in some kind of exile–spiritual exile, medical exile, separational exile, economic exile and so many other things which change our perceptions. The tension between being hopefully or cruelly ironic is the difference between being bitter or faithful. I need to hear someone else like this student of Ethan’s go through the same thing so long ago. One last thing before I wrap this up. Look closely at verse 25. The Davidic monarch as a seagoing power? I don’t think this refers to a Hebrew navy, because I’m not really aware of a great seafaring tradition for Israel or Judah. I suspect rather this verse reflects the Hebrew fear of the sea–something attested to in quite a bit of scholarship. The Davidic king is promised by God to be a master of the mysterious sea as symbolic of controlling all of the unknown forces in the cosmos. Of course, the New Testament student will immediately recall that our Lord walked on the sea as well as calmed its chaos. Thanks for spending some time during this Advent season with me meditating on these Psalms. I hope and pray you have a wonderful Christmas. Merry Christmas to you and all the Greenbeans as well! Thank you for the Advent reflections. we wish you the very best as well virgil–merry Christmas.